Hi, my name is Chuck. 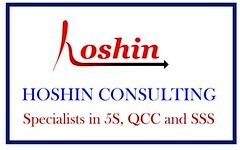 I am an old friend and business associate of Chun See's. Today I want to share with you (especially the younger ones) about a toy that I used to make and play with during my childhood days. Unfortunately, I don’t have Chun See’s skills in blogging. So I will ‘tumpang’ this article in his blog. First a bit of background about myself. 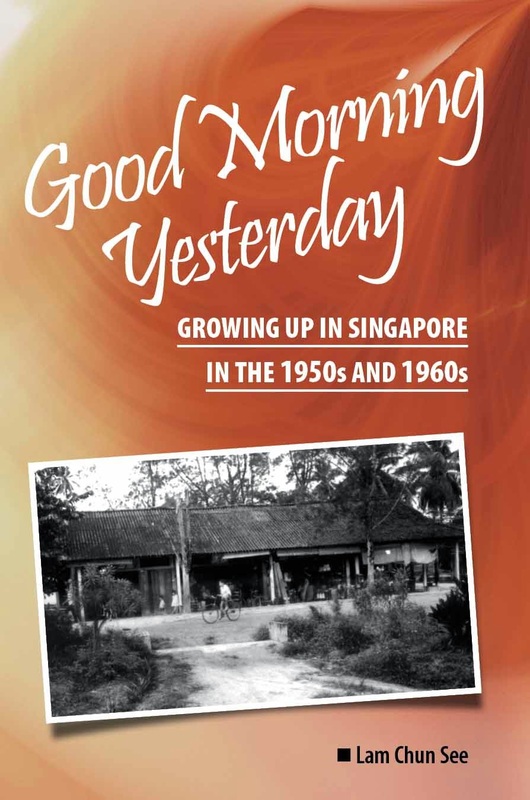 I was born in 1960 and grew up in a kampong that is located at the Hill View area off Upper Bukit Bukit Timah. Like Chun See, I have fond memories of the games and pastimes that we enjoyed as kampong kids. Those days, we kids have to design and make our own toys. One of those toys is the catapult. We called it the ‘Lastic’. I will explain to you how we make the lastic but please just learn this for knowledge only; and do not go and make one and do naughty things with it. It can be turned into a pretty nasty weapon. Select a good tree branch. 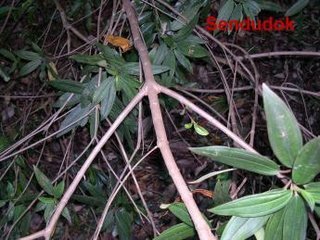 Look for a tree branch that has a Y-shape. The 2 arms should be roughly of equal size. Chun See says he and his friends used to make their lastic from the Sendudok, or Singapore Rhododendron, but I prefer the Tembusu tree which was easily found in our kampong. The Tembusu wood is stiffer and stronger and thus provide a more sturdy frame. Trim of the excess materials but leave sufficient length of the arms to be tied together with a binding wire. Trim off the bark. Roast the branch over a fire for about 10 to 15 minutes to remove the sap. We usually placed the it over 2 bricks and build a fire with dry twigs. Untie the arms. You will find that the arms now will retain a beautiful curved Y-shape. Now we can trim off the excess lengths from the arms. Get 2 strips of rubber of about 8 to10 inches long to form the slings. We usually cut them from the inner tubes of bicycles. Cut a small rectangular piece of leather and make 2 slits at the ends. Tie one end of the rubber strip to the lastic arm and the other to the leather. Use rubber bands to fasten them. Repeat for the other arm and there you have your completed lastic. What do we use the lastic for? We used it to shoot at toads, birds and fruits. For practice we shoot at lamp posts and tin cans. Chun See says he used his to shoot at his neighbour’s pigs which roam into their compound. For the ‘bullet’ we used small stones or pebbles. Sometimes we even use glass marbles, but it is a bit expensive. I hope you have learnt something new today. Again, I want to stress. This catapult can be quite dangerous. Please do not make it. 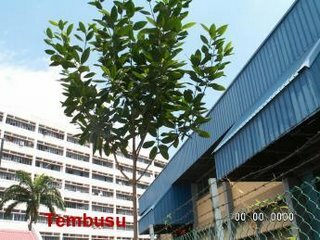 Acknowledgement: My special thanks to the management of Cititech Industrial Building for permission to chop off one of the branches of their many Tembusu trees. Wow, I'm really impressed! That's a beautiful catapult. I remember the only catapult I used (I grow up in the 70s) were my fingers and rubberband which I used to knock flies unconscious (not sure if i killed them or just knocked them out) to feed to my spiders. I would love to make that lovely catapult with my daughters but you are right, it's too dangerous (so says this generation of parents). I have one when I was young..It was made from the branches of guava tree (I think)...Used it mostly to shoot the rambutans off my neighbour tree. Actually this one is very sub-standard. My excuse is I have not done this for 30 years. 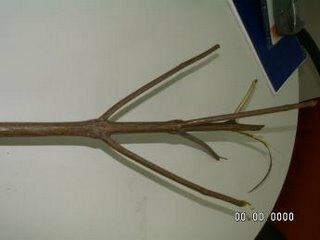 Also nowadays hard to find tembusu tree to cut. Saw some beautiful ones in MacRitchie when I went for brisk walking exercise with Chun See - but dare not cut for fear of getting caught. 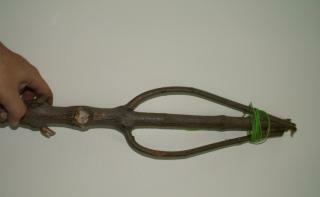 Chop down a tree branch to make a lastik for shooting at birds, toads, fruits and pigs? And I thought you are a nature lover, Chun See? I played with lastik too but I bought mine from the mama shop. The frame was made of thick stiff wire. For bullets, I used seeds of the mata kucing (small longan-like fruit). Nice of you to start this blog. It does bring back those days where I visit my relative in the kampong in the 80s when I'm still a kid. And those 'toy' my dad told me but I never since it before. Good job. Singapore is changing really fast. It nice to have your blog as a online history tour. Looks like Chuck is quite a 'weapons expert'. Have you read about the Gun he made for his son. Victor, We did not chop down the whole tree. Just a part of it. More branches will grow back later. I must confess that i used my lastic to shoot at the chickens, ducks and dogs as easy targets after I missed the birds and fruits on the trees! Oops but that was years ago when i was a little kampong boy! I must confess that I am one of those which the army calls 'elephant hunters'. I don't recall ever hitting any bird. Let me pour some cold water over the enthusiasm in using this harmless-looking weapon. When I was a kid one of my kampong friends nicknamed 'Swa Heer', meaning shark, was a sharp shooter with his lastic. On one occasion he proved his prowess by shooting dead a 'Pei Tow Kock', a white head bird with a brown body, perched in a bush, over a distance of about 15 metres, with a single shot. 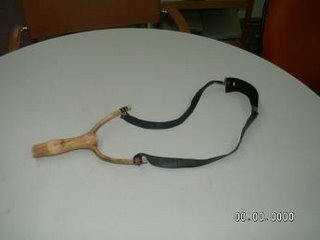 Using catapult to hurt or kill animals(like hunting) is not a good sport, in my own personal view. What to do - we were naughty kampong kids at that time. 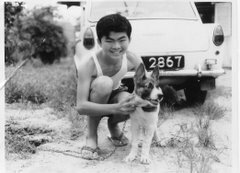 I think those days, we kampong boys were very cruel to animals. Thankfully, kids nowadays are more enlightened. i found my dad's old catapult that he always told me stories about, while clearing out his cupboard after he passed away recently, and its the exact same one in that picture. 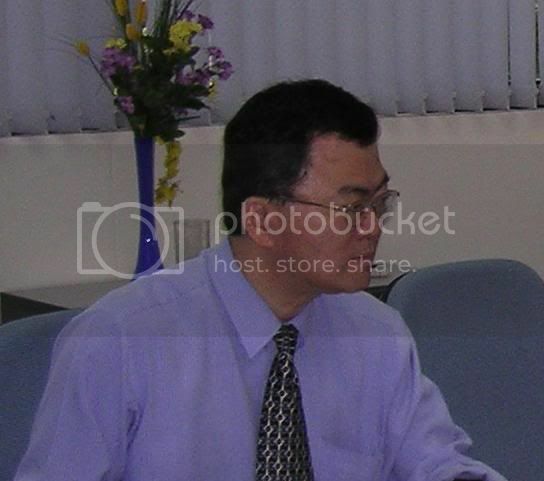 he also said that he preferred the tembusu tree and prepared it in the same method as mentioned in the post. It is interesting to learn about how toys were so much more meaningful in the past as compared to, say now, useless computer games and power rangers. Hi, I just discovered your blog recently and I really love reading it. It's helped me understand Singapore better, especially where I am staying now (Serangoon Avenue 4). Thanks for making the effort to make history interesting! Though I'm in my late twenties, I have to agree, Singapore is changing too fast! Anyway, I just want to drop a note that catapults can be bought from Golden Mile Complex, but of course, nothing beats making your own toy! sharon: which shop in Golden Mile?